A few weeks ago I shared my dad’s old fashioned recipe for chicken perlo. Chicken and rice must be a worldwide staple. 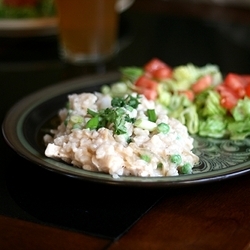 This herbed risotto with chicken is the Italian counterpart to my dad’s recipe. Made fundamentally of the same ingredients, it is amazing how the preparation totally changes the feel. While the chicken perlo is dependable, hearty, and filling, the risotto is rich, decadent and smooth. For a risotto recipe, this one is remarkably hands-off. I made both the chicken and the caramelized onions in advance which made the dish come together relatively quickly once it was dinner time. I added peas because I was feeling guilty about the lack of green on our dinner plates and the Omnivore commented about what a delicious addition they were. Add 1½ teaspoons of the olive oil to a large skillet over medium heat. Add the sliced onion and stir to coat. Allow the onion to cook, stirring occasionally, until deep golden brown and caramelized. Remove the onions to a plate and set aside. Add the remaining tablespoon of olive oil to the skillet used to cook the onions, set over medium-high heat. Season the chicken breasts with salt and pepper. Transfer the chicken to the heated skillet and cook, turning once, until each side is a light golden brown. Let cook until an instant-read thermometer inserted into the thickest part registers 165˚ F or until cooked through (no longer pink). Remove the chicken and transfer to the plate with the onions. Add 2 tablespoons of the butter to a Dutch oven set over medium heat. Once melted, add the garlic and cook just until fragrant, about 30 seconds. Add the rice to the pan, stirring to coat. Cook, stirring frequently, until the grains are translucent around the edges, about 3 minutes. Add the wine and cook, stirring constantly, until fully absorbed, about 2-3 minutes. Stir 5 cups of hot broth mixture into the rice. Reduce the heat to medium-low, cover and simmer until almost all liquid has been absorbed and the rice is just al dente, 16-19 minutes, stirring twice during cooking. Add frozen peas and stir gently and constantly until the risotto becomes creamy, about 3 minutes. Stir in the heavy cream. Cook over low heat 3-5 additional minutes, adding water to loosen the texture if necessary. Meanwhile, shred the chicken into bite-sized pieces. Stir the shredded chicken and caramelized onions into the risotto with the lemon juice, parsley and scallions. Season with salt and pepper to taste. Serve immediately. This entry was posted in Brady Evans Venables, Cooking, Food, Recipes and tagged Brady Evans Venables, Columbia, columbia sc, cooking, every woman blog, Famously Hot, food, hospital blog, Lexington, lexington medical center., lexington sc, Lexington Women, lmc, LMC every woman blogger, Midlands, Midlands Women, Recipes, shannon shull, South Carolina, South Carolina Women, Women, women's blog, women's hospital blog by Kate Gillmer. Bookmark the permalink.